I carried a fullsize FS for 3 years straight - many years back. It IS heavy. I loved Miami Vice. 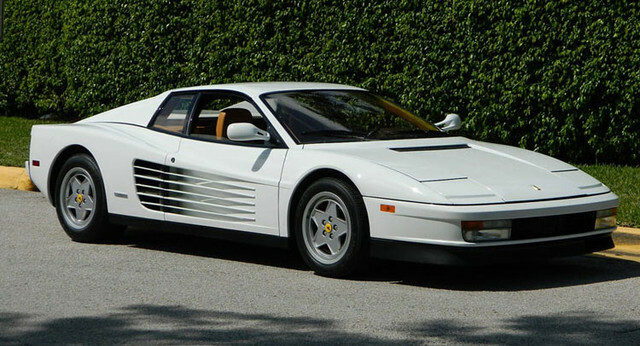 So, a white, 80s vintage Testarossa. I was partial to the black Ferrari Daytona that Crocket started with. It was a replica built on a Corvette chassis, but it was still cool. Defensive Tactics / Re: Accuracy: Combat or Target? I think over 90% of self defense shootings are less than 7 yards, with the vast majority under 3 yards. Still... I want target accuracy - that translates to combat accuracy. I shoot a target on a sheet of paper. It is reversed colored. White inner circle, and black outer circle. Much, much easier to shoot at than a black inner circle. If I can put an entire mag inside of the smaller white circle - at 7 yards, target shooting, I am satisfied with that. I have slight tremors in my left hand that has gotten a little worse as I have gotten older. But, I notice that it lessens if I go shoot in the afternoon as opposed to the morning. I always wish I can shoot better - but when I shoot with my favorite gun, I am usually one of the better shooters on the range. I do well enough. Because of physical limitations, I've gotten about as accurate in target shooting as I can be. Handguns and Revolvers / Re: The Alien Pistol! For $5k, it better include a ride on the Alien's mothership. Looks interesting but 5K? At that price the Alien pistol just alienated the majority of handgun enthusiasts. General Gun Discussion / Re: ..pistols lost/pistols found..phew.. I NEVER leave the house unlocked,,, not even with 3 German Shepherds. SACRAMENTO, Calif. — A federal judge on Friday halted sales of high-capacity ammunition magazines in California, giving state officials a chance to appeal his order last week that allowed their sale for the first time in nearly 20 years. U.S. District Judge Roger Benitez barred further sales until the 9th U.S. Circuit Court of Appeals considers whether to reinstate the state's ban on magazines holding more than 10 bullets. Glad ya found them. Very nice! I shot 3 boxes earlier today, using guns I don't usually shoot that often. So, I replaced what I shot. Off Topic Discussion (NON FIREARM RELATED) / Re: Generally Useless Tidbits Of Information! FYI - Academy has 50 round boxes of Blazer Brass for $9.99 each. Not too bad.